Hyperlinks, or links, are the mainstay of the internet. A link in your blog indicates you’ve researched your content and offer additional information to readers. Internal: A link between two pages on your website. Your website depends on those links for effective navigation. External link: A link from your site to another site. Without external links, there’s no World Wide Web. External links can direct readers to information that supplements your content. Incoming links: A link from another site to your site. 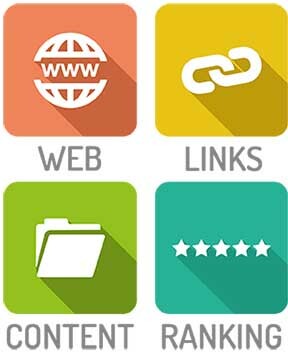 Also called a back link, the quantity and quality of sources of backlinks to your site are among the factors Google uses to evaluate your site ranking. Internal links encourage readers to click to other pages on your site with the goal of satisfying their need for information. Start with great content, then add links to articles, videos, infographics, or images. Consider which information is most important to your potential clients and use internal links to provide it. Internal links also help search engines find your pages. Links should include descriptive words relevant to the destination page to help search engines understand what your pages contain in order to be considered as an answer to prospective clients’ queries. External links help establish relationships, expand your reach, and provide information so readers can more fully explore a subject. However, you risk is losing readers to the new site. You can mitigate this risk by setting the link to open in a new browser page to tab so linking doesn’t take them completely away from your post. Volunteering in your community—being listed on another organization’s website may include a link to your site. Using guest bloggers who will, in turn, link to your site. Writing an article that includes a link to more information—that source will link back to you. Writing about current events, such as your thoughts on a newsworthy trial. Being a regular source on current events will earn links to your site. Lastly, check links to be sure they are working properly. Broken links gives readers reasons to question the veracity of your site.